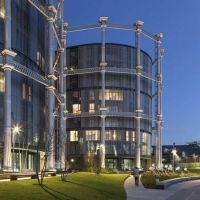 Bespoke Corten Steel planters were commissioned for the iconic Gasholders London development, in the heart of the King’s Cross urban regeneration zone. The planters are complex, asymmetrical cones in form; and they are massive in scale, with the largest being Dia. 4793 x H 2102mm and 1200kg in weight. Each planter was made from 12 sheets of 3.0mm Corten Steel, rolled to form, and welded to a sub-frame of rolled 50 x 50mm box section. The planters were each shipped in 4nr. sections, for on-site assembly; and lifting eyes were incorporated into the sub-frame structure, to facilitate installation via forklift. IOTA’s delivery was on the basis of design, manufacture, supply and installation; and IOTA also supplied the planters pre-weathered, with the characteristic patina of Corten already developed. IOTA’s planters were commissioned for this project by landscape contractors Maylim, for main contractor Carillion.